This time of year is jam-packed with outdoor entertaining and get-togethers. 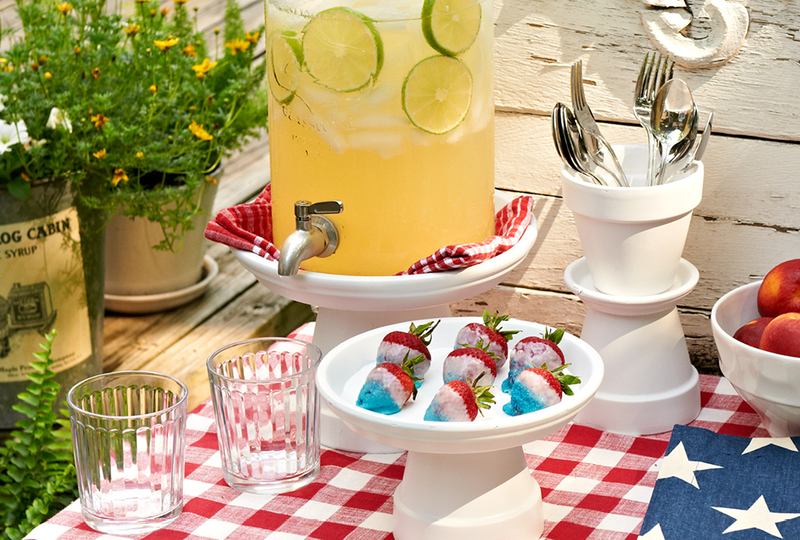 Whether it be graduation parties, backyard barbecues or Fourth of July celebrations, fun and festive gatherings are on everyone’s minds. When you’re getting ready to host your outdoor shindig, food and refreshments are always at the top of the to-do list. Often hosts and hostesses spend a fair amount of time worrying about matching dishware or serving dishes being big enough. Don’t worry, we have a great solution to handle both of these concerns — make your own stylish serving stands! Store-bought serving pieces aren’t cheap, but the materials for this project are easy on the wallet. The stands are made from simple terra cotta pots and saucers (before photo above), plus some construction adhesive, paint, and primer. Once you’ve chosen the terra cotta components, you’ll need to connect them. First, measure the diameter of the saucer and mark the middle point (photo 1). Use the hole in the bottom of the pot to center it on the saucer, and trace the outline on the saucer. Apply construction adhesive inside this traced circle, and then press the pot in place (photo 2). The adhesive will need to dry thoroughly, so be sure to check the container for the product’s drying time. After that time has passed, coat the entire stand with spray primer (photo 3). Once the primer is dry, you’re ready to apply paint. We wanted to keep our stands simple and cohesive, so we chose white spray paint as the finish. You can customize the color – or colors – of your stands to coordinate with your event’s theme. When the paint is dry, you’re ready to put your new serving pieces to work. The stands make it easy to set up an attractive, multi-level display of food, drinks, and utensils.